Instantly a divide in our generations and in our childhood geography was exposed. Certainly at age 11, I knew the names of all varieties of unwanted weeds and also the flowers and shrubbery that grew in our yard. And while our desert climate won’t host many of those plants, it was a stark realization that I’m probably not engaging him in enough chores – especially outdoor chores. Contemplating this post, I was thinking about my parenting and the value of kids doing chores at home and even found a few websites that talk about the best way to reward children for jobs. But, I was overlooking the opportunity to really appreciate what I’d discovered. Certainly I haven’t done a good job with my boys’ field botany skills but I was failing to be grateful for the tremendous education that my Grandmother has provided to me. Early in my childhood I was graced with the opportunity to live with her and in doing so, gained knowledge of every living thing in our midst from the allium and ajuga to cornflowers and morning glories. Her garden and especially the flowers within are her passion and although the low maintenance annuals that grow around my home require little intervention, I do have a deep appreciation for gardens of all sorts. Would I have learned these things without spending that valuable time with her? I doubt it and I also doubt that I would remember them if she did not have such a penchant for natural beauty. So rather than lament my inadequacies in getting my children to perform household duties, I’m going to seek out opportunities for them to have intergenerational experiences and conversations where they can build memories and knowledge. And there’s no better way to do that than over Palisade peaches. Preheat oven to 350. Melt 3 Tbs butter in a 10-inch cast-iron skillet over medium heat, using a pastry brush to coat sides with butter as it melts. Sprinkle 1/4 cup sugar evenly over bottom of skillet, and cook until sugar starts to bubble and turn golden brown, about 3 minutes. Arrange peaches in the bottom of skillet, on top of sugar cut side down. Reduce heat to low, and cook until juices are bubbling and peaches begin to soften, 10 to 12 minutes. Remove from heat. In a bowl, whisk cornmeal, flour, baking powder, and salt. Beat remaining butter and 3/4 cup sugar with a mixer on high speed, until pale and fluffy, about 3 minutes. Reduce speed to medium. Add eggs, 1 at a time, beating well after each addition and scraping down sides of bowl. Mix in vanilla and milk. Reduce speed to low, and beat in cornmeal mixture. Drop large spoonfuls of batter over peaches, and spread evenly using a spatula. Bake approx. 20 minutes until golden brown and a knife inserted in the center comes out clean. Remove from oven and let stand for 10 minutes. Run a knife around edge of cake. Quickly invert cake onto a cutting board. Tap bottom of skillet to release peaches, and carefully remove skillet. Because my parents and grandparents are long gone, my daughter won’t have the benefit of learning from them, which is one of the reasons I started my blog, to jot down my memories of them for her to read. I’ll be sure and bake that peach cake this summer. It really is delicious. I got it a bit too brown but I love the texture of the cornmeal. Oh Tammy, What a wonderful message to awaken to this morning. I really support you on the decision to teach the boys the joy of participating in home responsibilities. My sons are well accomplished in home and yard skills and as children they made great money in working for others maintaining yards. It sure helps a busy Mother at home to. My memories of helping Dad every Saturday, weeding the vegetable garden and mowing the lawn, from nine years on, gave me a huge love for growing things as well as those memories of my Father. The peach upside down cake sounds wonderful and I can hardly wait to try this dish. Last nite on a beach BBQ with neighbors, we had sweet potaos and fresh peaches baked in cast-iron. Just wonderful to. Thanks for the sunny thoughts on a NW grey day! Morning Sally. I really love this peach cake. Of course, I made NW berry pie last night. One of my best memories of my grandmother was her standing in her garden wearing light blue capris, a pressed white shirt, a large sun hat and garden gloves holding her trowel and smiling. There wasn’t a speck of dirt on her! She instilled the love of gardening in my father, who then passed it on to his daughters. Watering and weeding were part of my chores that, honestly, I enjoyed when I was younger as much as I do now. Perhaps it’s my version of meditation and a connection to those I love. Chores are difficult to instill in children, as performing the chore myself takes a small amount of time–having to remind my children to do the chore, and then they take more time arguing over who does which part of the chore (by which time they could have been completely done). But having them participate is important and somehow, in the process, they begin to appreciate those little things they previously took for granted. I absolutely agree that gardening is a form of meditation. I didn’t grow up with ‘chores and allowance’; we simply pitched in when the time came. I lived in a ‘Leave it to Beaver’ house my parents had build, with gardens my mother fashioned after the latest demonstration garden at the San Francisco Conservatory. She even replicated the Conservator’s legendary clock made entirely of ice plant! Fruit and vegetables came from multi-generational family gardens and orchards. We grandchildren learned the names of all of the plants in Gram’s garden since she used to send us out to find the flower she intricately described just to get us out of her hair when she made our initials in biscuits. It makes me sad my daughter’s generation didn’t grow up this way. My parent died young; the ranch and vineyards all went to eminent domain and freeways. I made certain she visited my great aunts and uncles so she revered our elders and heard the stories. She didn’t have ‘chores’ either, but she knows when it’s time to ‘be honest’, as Dad used to say, and pitch in to get the work done! It was easier to learn in the olden days … the grapes in the vineyard or the groceries in the trunk waited on no one! And I’m certain she’s learned many other things that you can be proud of. You’ll love it – very easy and tasty. Sounds like a fabulous use for the piles of peaches we have in the Carolinas right now. Yum. Thanks for sharing! You’re very welcome. I hope you enjoy – let me know. Yes, they do! I’d forgotten how much I enjoy them. You’re luck to have had a great teacher like your grandmother. As a child, I hated being out in the hot sun weeding dandelions and it’s taken me decades to decide to start my own garden. Now I love it, but of course I get to choose what time of day to go out, how to dress, etc. Be gentle with your children – if they don’t love being out in the garden, don’t force them! Oh yes! My point was to appreciate what I have learned rather than lament what I haven’t taught. I can’t begin to tell you the things I’ve learned from my grandmother as well as an older neighbor (name Isabelle) growing up! I know what I know now about gardening from spending time with Isabelle. Most things went in by osmosis – I never really knew I was ‘learning’ at the time. I thought I was simply doing chores – like snapping beans or weeding – when all the while there was Isabelle chatting away. She taught me about Jack-in-the-Pulpits and rhubarb. Money plants and the wonders of peppermint leaves. I think about her all the time when I’m outside. Now my grandmother – from her I got the BEST mollasses cookie recipe, as well as my love of crepes. She taught me silly songs, how to make jigsaw puzzles, play canasta and keep a clean house. Again, no idea all these lessons were creeping into the deep recesses of my brains. Thanks for clarifying that Hannah! And thanks for appreciating my choice to be grateful. Tammy – a beautiful post. I have no children, so I surely cannot comment on parenting. But I once WAS a child and my parents gave us chores and i grew from it. Recently Dad and I were reminiscing about my first bike – which I got in 1958 when I was 9. I wanted a bike SOOOOOO badly and my parents told me I had to save money and buy it myself. They gave me a list of additional chores that I could do for money. The bike was $26 – seemed a fortune! But each time I picked up a bushel of apples in the yard, or cleaned a kitchen cabinet I could FEEL myself getting closer to my prize. Finally I had my $26 and Dad took me down to get my bike. I’m 62 now, Dad is about to become 87 – and he asked me if I still remembered that bike’s color. Oh yes, Dad! Blue! I mean when you’ve picked up bushel after bushel of rotting apples, cleaned cabinets, swept basement floors – the money MEANT something to me. And so did the bike. But the best? The lessons I learned that winter-spring-summer. They’ve lasted a lifetime. It’s my opinion that we don’t ‘treat’ kids by ‘letting them off the hook’. GREAT post, Tammy. And man that recipe looks good! Thanks. I’m glad you can relate and yes, the peach cake is really worth trying. I love this story! I don’t have any children, but I do wonder how many kids these days know about ‘outside kinda’ stuff. My grandmother taught me about foraging for wild foods and to this day, I still pick young poke greens in the spring to eat. You can’t buy anything like them. So your children’s experiences with their older family members will certainly be learnings and memories that they’ll lean on for the rest of their lives. Thanks for sharing! And I wouldn’t know a poke green if he was sitting next to me! Sounds like you’ve garnered some fascinating expertise from grandparents. Grandparents are a very special way for children to learn things. I gained a love of crocheting from watching my grandmother always making something beautiful. Warm peach cake or pie is wonderful. Yes, I think I learned that too but it is something I have forgotten. Thanks for the kind words Kathy. I thought the same thing “what’s bindweed?”. Love the recipe. Peaches seem to be the fruit of the month. I’m not usually a peach eater but with all the great recipes I’ve seen posted, the urge to buy them is winning me over. Yes, peaches speak of summer and here summer is winding down so they are prolific. Lovely writing. I’m always so grateful when people share bits of their history. We all learn something about what it is to be human. Ahh yes, the humanities. Another passion of mine and another post for another day. Getting a writing compliment from you is a big deal. Thanks Jane. Thanks Jane. Yes, I do feel like a peach when I see it. As it does here too Cindy. I have some plans in mind for my boys as well. Wish I had been there too. Next time. You will be next time. I learned best next to my grandparents. It’s too bad that so few families live with three or more generations now. The peaches are making my mouth water! I agree. The one thing that I would love to change about my own life is how spread out our family is. This post really hits home with me because my grandmother has recently been sick and I’ve been reflecting on how much she’s meant to me. She also imparted invaluable things to me–things my two sons have shared with her to a certain extent–but not enough. I think it’s so amazing you learned about so much natural beauty growing up–being able to name, I think, can make the beauty even more enjoyable. I agree that it makes the natural beauty even more enjoyable. I’m glad that you cherish her. Never had Colorado peaches, but I’m glad to know you have some. I LOVE peach season! I’ve never tried peach upside-down cake, but can’t even guess how many pounds of peach pound cake I’ve eaten. . . and don’t even ask about peach ice cream. Nectar of the gods! Mmmmm. They all sound great. Being outdoors is really a great way to teach! Great post, it reminds me of growing up with 4-H, I never appreciated the skills I learned from being involved, but canning and cooking are second nature to me, and not the current trend. I’ve never appreciated until now how valuable these skills are for this city girl. Hey I was a 4-H kid too and agree that it was a great source of knowledge for me. Great story about your grandmother Tammy and about the importance of inter-generational bonding. As more people slow down a bit and get reconnected to their roots, to the earth, to fresh local food, to making their own food, this kind of thing will only happen more. I hope that is true. I think these interactions are really important. Upside Down Cakes are delicious! That version is wonderful. What a lovely post, memories are so precious. My Grandmother has passed away now but I always remember sitting with her looking through her photograph album while she told me stories about all the people in the pictures. Thank you for posting the recipe. It sounds delicious. It is a yummy cake. I’ve been thinking a lot about this post–in part because my background was so urban, and the focus/influences of my grandparents, long-departed, and parents, quite aged, were so detached from the natural world. With my only daughter getting married soon, and the prospect of my becoming a grandmother nears, I realize it’s up to me to nurture those connections. I really like what cornmeal brings to this peachy recipe! And both your daughter and grandchildren will benefit so much. And I agree about the cornmeal in this recipe. Ah, yes, the generational gap. Got to say that I don’t really know the names of the weeds, but I know they *are* weeds and I’ve taught my girls to pull the little suckers up by the roots! But I find phrases that I grew up hearing are completely lost of my kids. I have to repeat them and explain them and by that point, they’ve lost their effectiveness. But I figure at least they know the phrase now. Your recipe sounds like heaven. I love peaches and my sister bakes peach scones that are to die for! Maybe this cake recipe will knock her socks off (speaking of a phrase my kids giggled over upon first hearing it)! Yes, the phrases! I hadn’t thought about them but there are many. And yes, your sister will love this. I was actually doing some similar musing myself, recently, when I realized that my mother’s generation knows the names of flowers and other plants, and then after that the knowledge totally drops away. People in my generation and younger (and in my class/educational background) are so well-educated about and concerned with politics, social analysis, semiotics, modern culture and media studies, etc… But we don’t know the names of plants. An interesting shift to observe! And I’m sure there are other areas where our knowledge has dropped away as well. Thoughts? What a lovely post! I really relate… I also learned so much from my grandparents – they were a huge part of my life growing up, and one of them – also 92 – still is! I also have very good memories of helping one of my grandma’s in her beautiful garden. It may be why you enjoy the things that you do. Reading this I realize how much I’ve missed out on by always trying to get out of doing my outdoor chores. This summer has been the first in my life that I actually wanted to go out and help pull weeds. And in one day I learned more than I had in 20 years. Thanks for this post! I’m definitely going to try to get to know the elders in my family and get as much information out of them as I can. Good for you Chelsea. It’s one area where time really matters. Enjoy the process. I also loved learning all I could from my grandparents back when we still had a garden and often wish they never moved from there. Love your thoughts on this, intergenerational experiences are a must in my books too for when I have children. PS: can’t wait to try that recipe! And welcome back from vacation. I hope you had a great time. Yeah, not much opportunity for gender specificity in my house unless I want to do everything. P.S. You certainly aren’t alone when it comes to not giving your child enough chores to do around the house, inside or out! Yes, as my sister-in-law said, it’s too often easier to do it myself. Alas! The value of intergenerational activities is wonderful!! Let your children enjoy your grandmother while you can. I’m visiting my parents right now because my father’s under hospice care. Unfortunately, he’s at the point about all we can do is hold his hand or rub his back. How I wish I could hear some of his stories again! Ironically, I went to a youth-group event tonight and the youth spoke about being focused on intergenerational activities. I was really pleased to hear it. I’m also terribly sorry about your dad. Blessings to you and your family. Intergenerational experiences! IMO, this is one of the greatest things missing in modern smaller families. Growing up in a ‘joint family’ in India, it was common to have at least 3.5 to 4 generations of peoples iving under the same roof. We learnt to communicate, negotiate, teach and learn with people of all ages. In the evenings, people from different generations shared the experiences of their respective lives – past or present. It was a rich storytelling atmosphere. I can’t even imagine what kids in modern families are missing. You are so fortunate to have grown up in an environment like that! How interesting. I love hearing how people parent — there’s so much variation. The one thing I remember my mom saying is, “Every child gets what every child needs” — but I think all kids need structure and guidance, and to be enlightened. Sounds like your boys will get all of the above 🙂 And those peaches…GORGEOUS! Mhmm peaches… I can’t wait until it’s summer here and we get some summer fruit! Sounds like you are living down-under? Beautiful post, Tammy. Thank you for the caring reminder of my grandfather who so loved gardening! Funny, we are ready to kiss the summer good-bye but the peaches were the best this year. What a wonderful post. I am lucky in having so many inadequacies as a parent that my parents, and mother in law, simply move in effortlessly to fill the gap. The children know that needlework is Granny’s job, outdoor activities are Grandpa’s bag, and the very best cooking comes from Grandma. None of the wiser generation has so far bagged the ironing, at which I am utterly deplorable. We share a lack of ironing skills. Your kids are very lucky to have their grandparents. 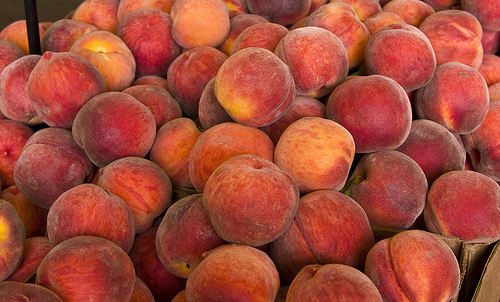 My mouth started watering like Pavlov’s dogs when I saw those peaches. They are my favorite food in the world, right above sushi. Coincidentally, I’m making a peach upside down cake tomorrow – my recipe. It’s the only thing I can do pretty much perfectly. I hope I didn’t just jinx it. I’m sure you didn’t. I’m curious about whether or not you’ll use cornmeal. That cake sounds delicious. I love peaches so this gets a big thumbs up. I think you will love it. The cornmeal adds a really great texture. My goodness! 94 comments. You are a favorite for sure! Thank you for another wonderful post, on various levels. From my paternal grand-mother (Italian origin) I learned several recipes from her country, especially one that is a traditional meal for Christmas. Joséphine, my other grand-mother, taught me all about the life of mountain farmers. I am grateful to both and to my mother who was visiting them often and insisted for my sister and me to talk and listen to them. How I loved those days ! I will definitely try your delicious looking Upside Down Peach Cake, a bit like a Tarte Tatin 🙂 Thank you Tammy. You are very welcome Isa. It sounds like you had a wonderful upbringing. The peaches are so divine looking, I remember these growing in our backyard as a child, when we lived in colder climes. Wonderful. As always enjoy your posts Tammy! It’s like catching up with an old friend. All the best! Thanks June. That’s a very kind thing to say. Kids really do learn by doing, and I’m sure your son has a good understanding of those weeds now. In my area, there are some gardening projects sprouting up for kids, through 4-H Cooperative Extension. It’s great to see so many [city] kids getting out there working the soil, planting seeds and learning first-hand the joy of harvesting food. Another reason to feel lucky to be in New Hampshire, I guess! I grew up in a 4-H cooperative extension area and I think it was a great foundation. And yes, you are lucky to be in NH!